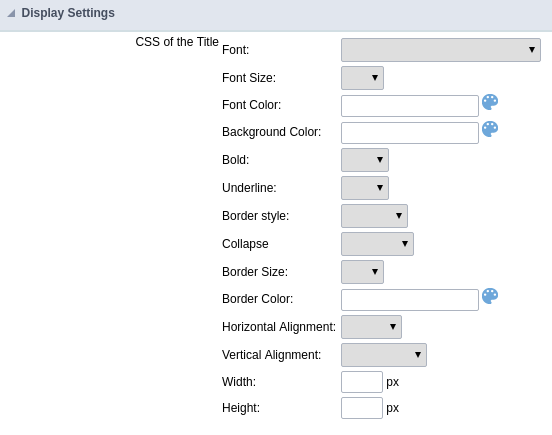 This field allows the developer to create a field for rating using stars (or any other image), where the final user will be able to select a rate option according to the configuration made by the developer. Description of the attributes availables for configuration. Define the type of the field in the application. In this case we must select the type Rating. Define the application title that will be showed when the application is executed. The terminology used in the interface of your application is very important for the usability, and we need to use familiar terms for the final user, instead of use terms from the system. Example, this field “rating” that is named cmp_rating however, the customer would have a better understanding if the label uses Product Rating. Besides use a fixed text, the Label attribute allows the use of Langs to define the field title, allowing the internationalization of your application. Define the subtitle that will be shown in the field below the ratings. Example: “Thank you for your feedback!”. As in the Label, the subtitle attribute also allows the use of Langs for internationalization of your application. Define the number of icons that will be displayed in the field. The value set in this attribute must be according to the way the evaluation will be realized. Define the icon that will be shown for the amount selected. Following the like/dislike example, in this option, we must insert the Like image . We must do the same for a star evaluation, where for default we must insert the stars filled . Define the icon that will be shown for the not selected icons. In this attribute, we set an image to represent the opposite of the previous images set in the Enabled icon. Still referring the example of the Like/Dislike, in this attribute we must set the Dislike . As in the stars example, we must insert the image with the empty stars . Allow the definition of an initial value for the field when the form application is in insert mode. The only option available in this field is Defined. Selecting this option the attribute Initial Value will be showed for set the value. 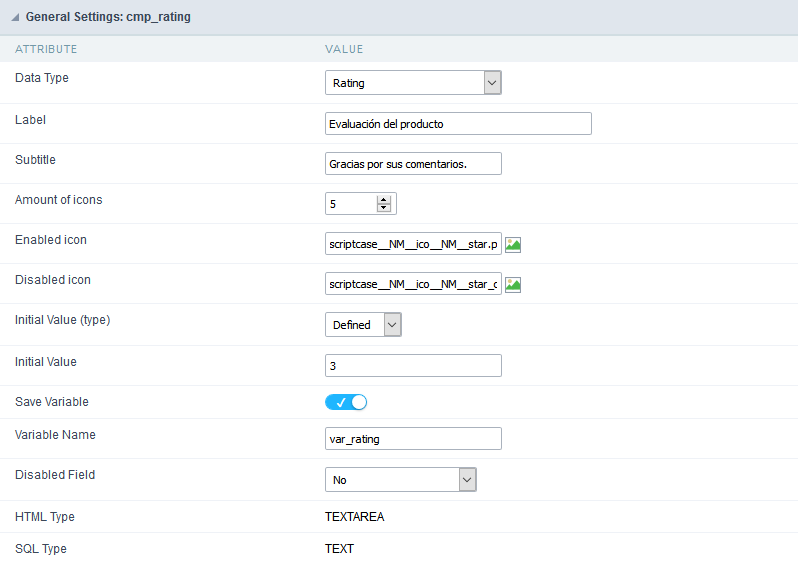 Example: The initial value is 3 when inserting a new record, the rate field will initiate with 3 stars already selected. The value defined in this attribute will overlap any value defined previously. Allow saving a session variable(Global variable) with the field value for being used in other applications. Example: In the login form, the user name can be saved in the session and used to be displayed in the header of other applications. In this attribute, we must define a name for the session variable that was enabled previously to receive the field value. We must inform only the variable name, - var_rating. We can recover the value as a global variable. HTML object used to show the form field. Inform the type of the field in the database.